Kate, Holly, and Mary Elizabeth are three of a kind who love all things country and quilted. These Gooseberry Patch® Country Friends® have pieced together a quilting adventure as enchanting as an old Friendship quilt. You'll find the prettiest quilts, a sprinkling of recipes, and quick and easy gifts to give. Themes include There's No Place Like Home; Apple Goodness; Cheery Cherry Nursery; Let It Snow! 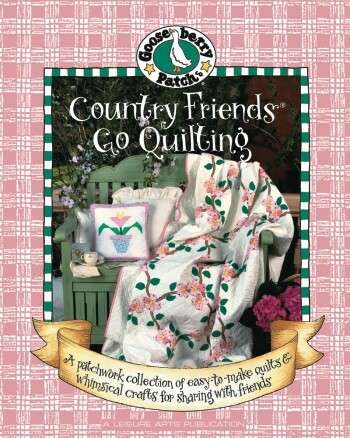 ; Springtime Blossoms; Picture-Perfect Quilts; Fireside Quilts; and Friendship Gifts. Projects are wall hangings, bed quilts, pillow shams, pillows, table runners, soft sculptures, place mats, hand towels, window treatments, a wreath, a mantel scarf, a needle case, and other creations. 128-page soft-cover book.